1 So in the ninth year of Zedekiah’s reign, on the tenth day of the tenth month, Nebuchadnezzar king of Babylon marched against Jerusalem with his whole army. He encamped outside the city and built siege works all around it. 2 The city was kept under siege until the eleventh year of King Zedekiah. A siege wall around the city prevented food and supplies from entering the city; eventually the population was starved out. 3 By the ninth day of the fourth month the famine in the city had become so severe that there was no food for the people to eat. 4 Then the city wall was broken through, and the whole army fled at night through the gate between the two walls near the king’s garden, though the Babylonians were surrounding the city. At this desperate point for Judah at the siege of Jerusalem, King Zedekiah made a last-chance effort to escape the grip of the nearly-completely successful siege, planning a secret break through the city walls and the siege lines of the Babylonians, using a diversionary tactic. They fled toward the Arabah, 5 but the Babylonian army pursued the king and overtook him in the plains of Jericho. All his soldiers were separated from him and scattered, 6 and he was captured. So the final thing he saw — was the killing of his sons. Blinding prisoners was unusual, since most prisoners would be put to work. But blinding the king had a highly symbolic significance–obviously he could not lead the people now–as well as a dispiriting emotional impact on the deportees. the royal palace and all the houses of Jerusalem. Every important building he burned down. They burned your sanctuary to the ground. 10 The whole Babylonian army under the commander of the imperial guard broke down the walls around Jerusalem. 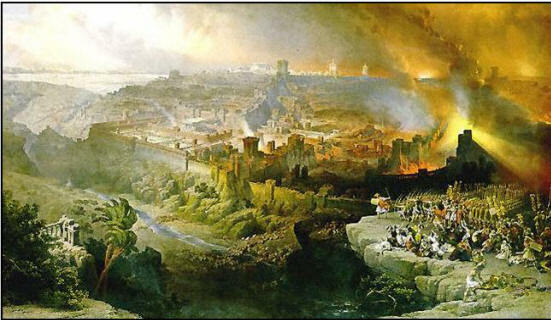 The walls of Jerusalem–the physical security of the city–were now destroyed. Jerusalem was no longer a place of safety and security. The walls would remain a ruin until they were rebuilt by the returning exiles in the days of Nehemiah. 11 Nebuzaradan the commander of the guard carried into exile the people who remained in the city, along with the rest of the populace and those who had deserted to the king of Babylon. 12 But the commander left behind some of the poorest people of the land to work the vineyards and fields. 16 The bronze from the two pillars, the Sea and the movable stands, which Solomon had made for the temple of the LORD, was more than could be weighed. 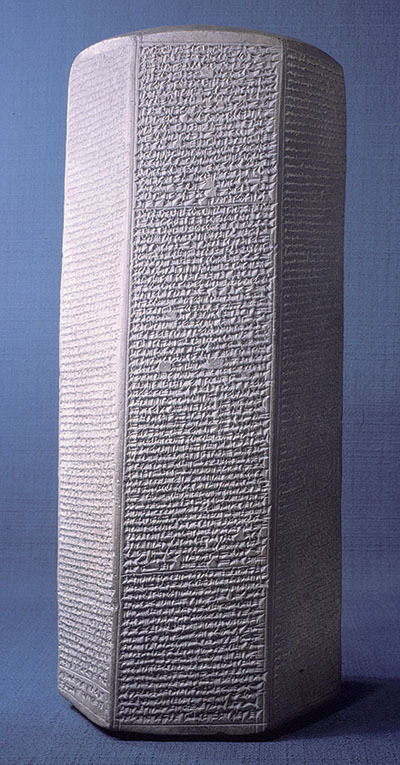 17 Each pillar was eighteen cubits high. The bronze capital on top of one pillar was three cubits high and was decorated with a network and pomegranates of bronze all around. The other pillar, with its network, was similar. Jerusalem was left desolate, completely plundered under the judgment of God. “Away from her land.” Yet — this is not the end of the story! We rejoice that some Jews will return to Judah, and particularly to Bethlehem in Judah, because not even a total military defeat and deportation to far-off lands will be able to thwart God’s plan of salvation and the coming of Jesus! HERE is the “Nunc Dimittis” from Rachmaninoff’s Vespers, the Robert Shaw Festival Singers. According to Thy word, in peace. Reasonable and pragmatic advice, to humble one’s self and to submit to the judgment of God brought through the Babylonians . . .
. . . which was considered treason by others . . .
Jehoiachin was not sent away from the king’s palace with a store to last him for months, but his provision was given him as a daily pension. Herein he well pictures the happy position of all the Lord’s people. A daily portion is all that a man really wants. We do not need tomorrow’s supplies; that day has not yet dawned, and its wants are as yet unborn. 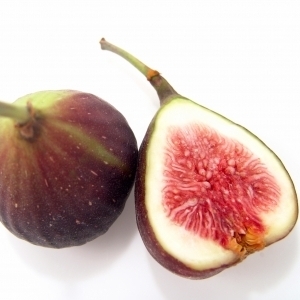 The thirst which we may suffer in the month of June does not need to be quenched in February, for we do not feel it yet; if we have enough for each day as the days arrive we shall never know want. Sufficient for the day is all that we can enjoy. We cannot eat or drink or wear more than the day’s supply of food and raiment; the surplus gives us the care of storing it, and the anxiety of watching against a thief. 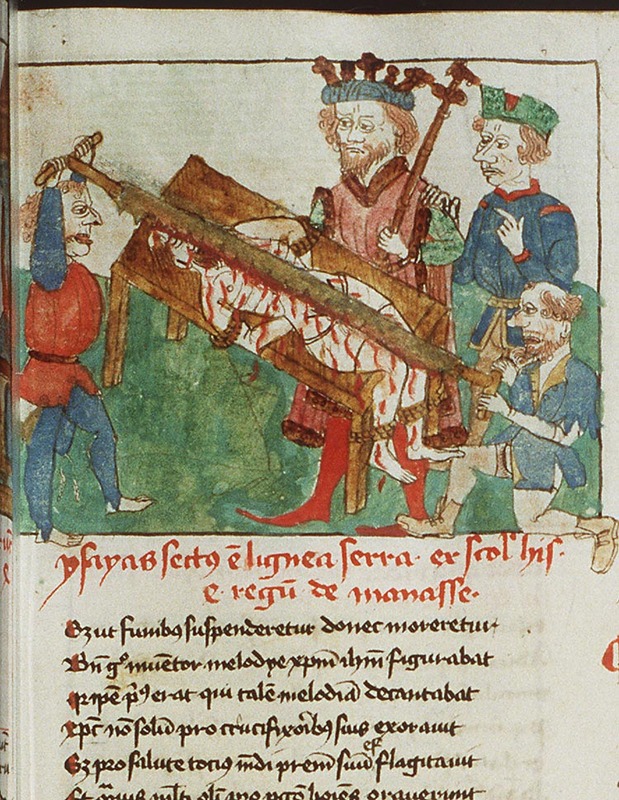 One staff aids a traveller, but a bundle of staves is a heavy burden. Enough is not only as good as a feast, but is all that the greatest glutton can truly enjoy. 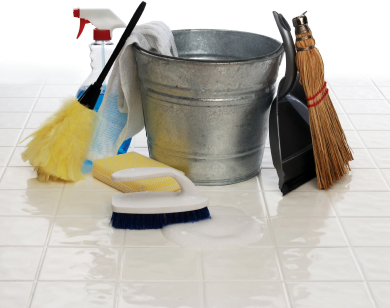 King Josiah finds he has major cleaning to do, ridding the kingdom of all signs of idolatry. 1 Then the king called together all the elders of Judah and Jerusalem. 2 He went up to the temple of the LORD with the people of Judah, the inhabitants of Jerusalem, the priests and the prophets—all the people from the least to the greatest. 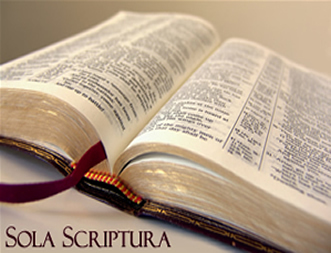 He read in their hearing all the words of the Book of the Covenant, which had been found in the temple of the LORD. 3 The king stood by the pillar and renewed the covenant in the presence of the LORD—to follow the LORD and keep his commands, statutes and decrees with all his heart and all his soul, thus confirming the words of the covenant written in this book. Nearly all the rest of this chapter details what Josiah did to eliminate idolatry in the land. As you read, notice the extent of the worship of false gods. Notice the many gods and goddesses, priests, places, buildings, support activities — here, there, everywhere — idol worship was deeply ingrained in the kingdom. It takes significant effort on Josiah’s part to root out all the many tentacles of idolatry. 4 The king ordered Hilkiah the high priest, the priests next in rank and the doorkeepers to remove from the temple of the LORD all the articles made for Baal and Asherah and all the starry hosts. He burned them outside Jerusalem in the fields of the Kidron Valley and took the ashes to Bethel. 5 He did away with the idolatrous priests appointed by the kings of Judah to burn incense on the high places of the towns of Judah and on those around Jerusalem—those who burned incense to Baal, to the sun and moon, to the constellations and to all the starry hosts. 6 He took the Asherah pole from the temple of the LORD to the Kidron Valley outside Jerusalem and burned it there. He ground it to powder and scattered the dust over the graves of the common people. 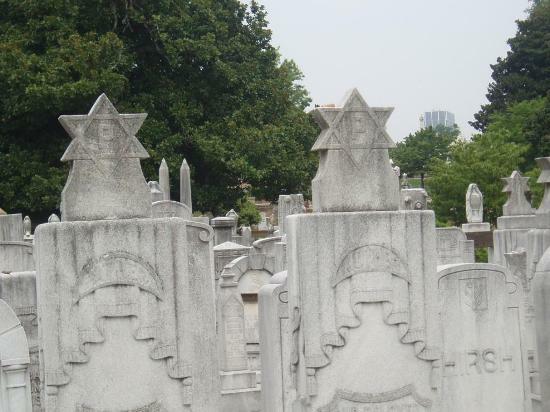 Jewish graves in Atlanta, Georgia. This was not meant to desecrate the graves. Rather, the ashes were desecrated by being flung on dead things. In just a few verses, we will read of bones being burned on altars to defile the altars. The dead bodies/bones make whatever they touch unclean. 10 He desecrated Topheth, which was in the Valley of Ben Hinnom, so no one could use it to sacrifice their son or daughter in the fire to Molek. 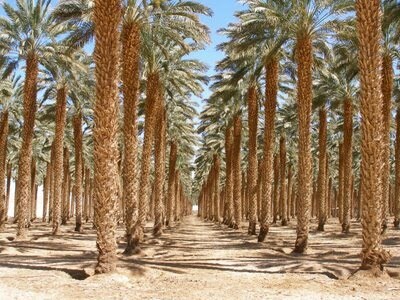 11 He removed from the entrance to the temple of the LORD the horses that the kings of Judah had dedicated to the sun. They were in the court near the room of an official named Nathan-Melek. 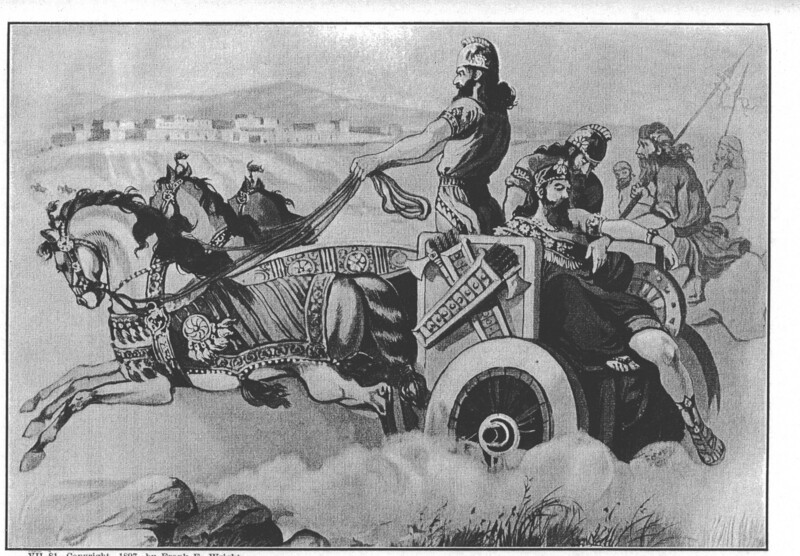 Josiah then burned the chariots dedicated to the sun. 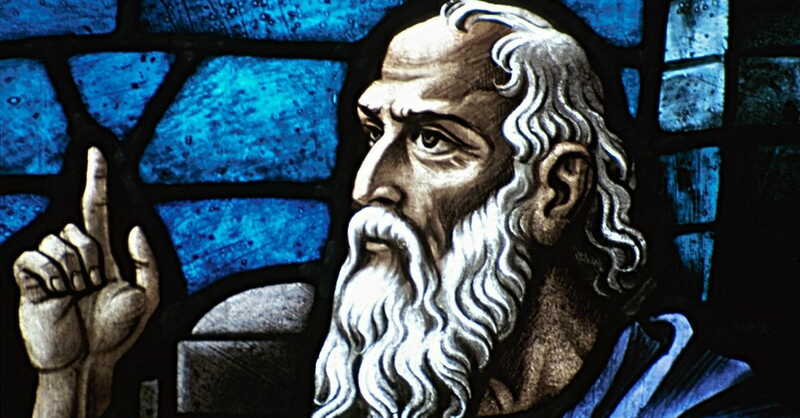 After getting rid of some of King Solomon’s contributions to idolatry, Josiah even takes his reforms up to Bethel in the former Northern Kingdom. This is the remarkable fulfillment of a prophecy made hundreds of years earlier. The words of this anonymous prophet are recorded in 1 Kings 13:1-2: Behold, a child, Josiah by name, shall be born to the house of David; and on you he shall sacrifice the priests of the high places who burn incense on you. Josiah was careful to honor the gravestone of this anonymous prophet. For years Coca Cola has been made with high fructose corn syrup, a low cost sugar substitute made with (surprise!) corn. Corn is a leavening agent which means it must be cut out of the Jewish diet for Passover. So, to serve the Jewish population in large cities in the United States, the Coca Cola company opens a special production line, supervised by a rabbi, to make a kosher Coke alternative with real sugar instead of corn syrup. 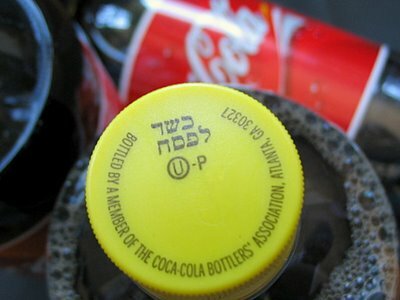 Passover Coke (bright yellow cap with Hebrew writing) is hard to find but flies off the shelf wherever it’s sold, since many people remember the flavor as the “old” (they would say tastier) Coke. HERE is the incomparable Phil Keaggy and “True Believers,” to encourage us to “stand on every word You say.” Josiah was faithful, but, as this chapter continues, guess what will happen . . .
Phil is a seven-time recipient of the GMA Dove Award for Instrumental Album of the Year, and was twice nominated for a Grammy Award for Best Rock Gospel Album. He has frequently been listed as one of the world’s top-3 “fingerstyle” as well as “fingerpicking” guitarists by Guitar Player Magazine readers’ polls. 29 While Josiah was king, Pharaoh Necho king of Egypt went up to the Euphrates River to help the king of Assyria. Assyria was in decline and Babylonia was ascending. Assyria turned to Egypt for help against the Babylonians. Pharaoh Necho of Egypt was marching up to Assyria, through Judah. Josiah tried to stop him . . .
King Josiah marched out to meet him in battle, but Necho faced him and killed him at Megiddo. 31 Jehoahaz was twenty-three years old when he became king, and he reigned in Jerusalem three months. His mother’s name was Hamutal daughter of Jeremiah; she was from Libnah. 32 He did evil in the eyes of the LORD, just as his predecessors had done. 33 Pharaoh Necho put him in chains at Riblah in the land of Hamath so that he might not reign in Jerusalem, and he imposed on Judah a levy of a hundred talents of silver and a talent of gold. Pharaoh Necho in this chapter is known in history as Necho II. 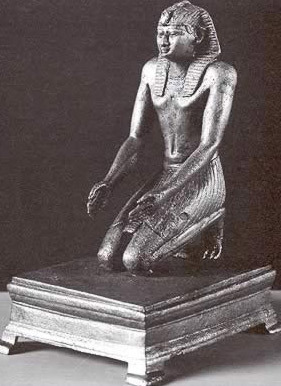 This bronze statue of him is in the Brooklyn Museum. So now Judah is effectively a tribute state to Egypt. 34 Pharaoh Necho made Eliakim son of Josiah king in place of his father Josiah and changed Eliakim’s name to Jehoiakim. But he took Jehoahaz and carried him off to Egypt, and there he died. 35 Jehoiakim paid Pharaoh Necho the silver and gold he demanded. In order to do so, he taxed the land and exacted the silver and gold from the people of the land according to their assessments. 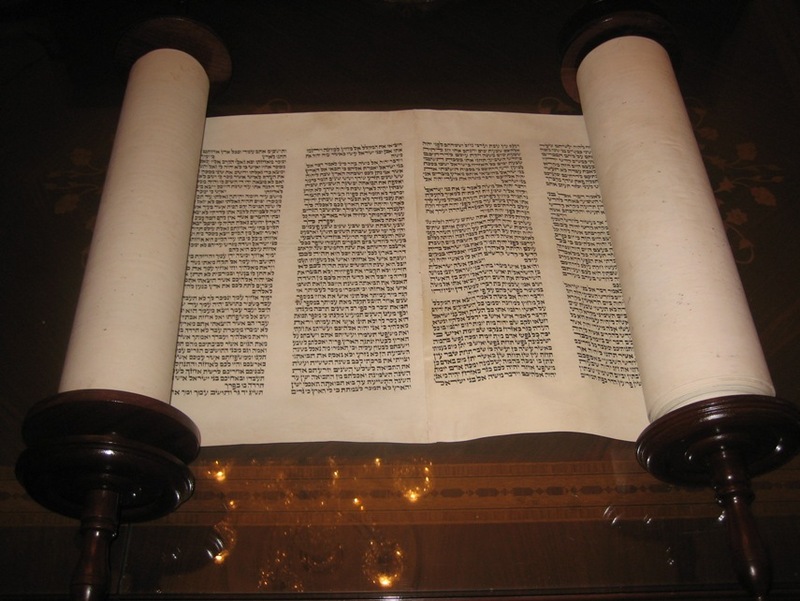 Torah scroll: the book of the Law. 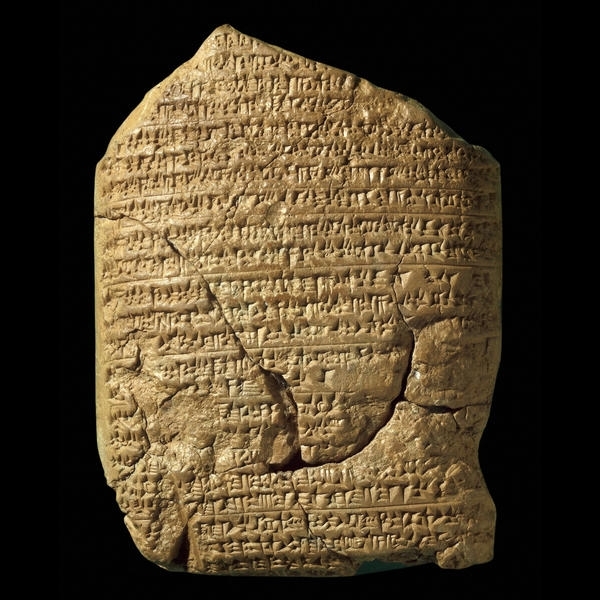 What was presented to Josiah may have been the entire Pentateuch (Genesis – Deuteronomy). We are at the very end of the history of the kingdom of Judah. Her most wicked king, a man named Manasseh, had reigned for 55 years. During his time on the throne, he took the nation into the very depths of depravity. It seems he coldly calculated how to break each of God’s commands. He filled Jerusalem and the temple with pagan idols and altars and he filled the city with innocent blood. The king and the people were so utterly corrupt that God said they had far exceeded the perversions of the Canaanites who lived there before them, and who had been judged for their wickedness. The scale of justice had been irreparably tipped to judgment and it would only be a matter of time till the Babylonians came and destroyed the nation, her capital, the temple, and carry away the people into exile. After Manasseh died, his son Amon reigned for a short time, being assassinated in a royal coup. Then his son Josiah became King. He was only 8 when his reign began but from the beginning, he had a heart to serve God. Once his grip on the throne became secure, he moved to undo the perversions of his grandfather and father. In the 18th year of his reign, he gave orders that the temple was to be repaired. Years of abuse and neglect had resulted in much damage and Josiah was diligent to make sure the house of God was restored. So he sent a delegation of royal officials to the high priest with orders for workers to begin repairs. 1 Josiah was eight years old when he became king, and he reigned in Jerusalem thirty-one years. 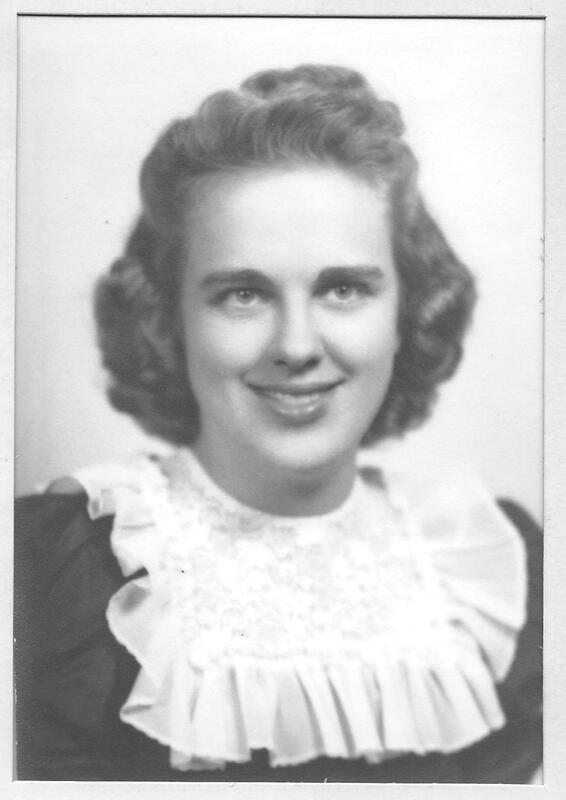 His mother’s name was Jedidah daughter of Adaiah; she was from Bozkath. 2 He did what was right in the eyes of the LORD and followed completely the ways of his father David, not turning aside to the right or to the left. According to Jeremiah 1:1-2, the Prophet Jeremiah was the son of this priest Hilkiah. Jeremiah began his ministry during the reign of King Josiah. Josiah orders both necessary funding and necessary management for the project. Shaphan was the head of the delegation of officials who went to the temple with Josiah’s order. 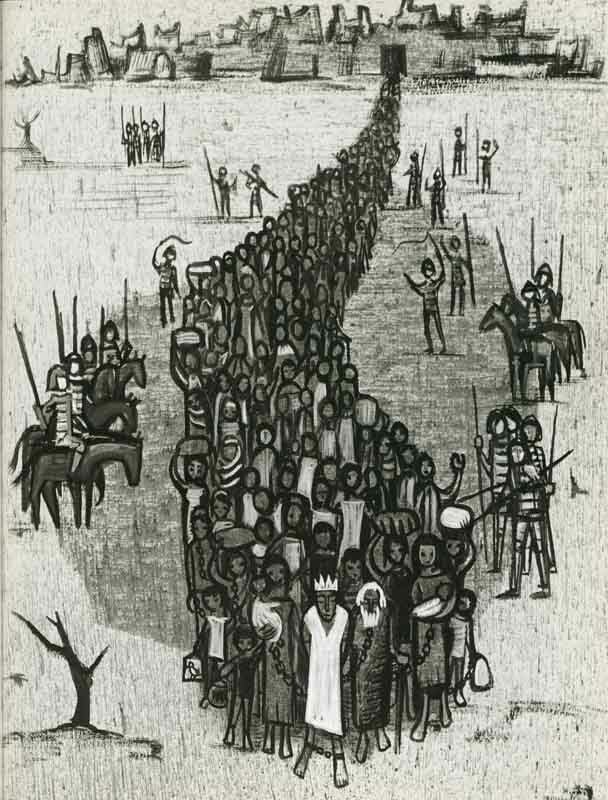 They stayed for a short time to make sure the work had begun so they could return with a full report to the king. But it wasn’t long after the repairs had started that Hilkiah, the high priest, came to Shaphan with an urgent message. The Book of the Law had been discovered, either by one of the priests or one of the workmen. He turned it over to Shaphan, who immediately opened the scroll and began to read. He returned to Josiah with news that the repairs were well underway, and that the long lost Book of the Law had been found. Then he read it to the king. I prayed for faith and thought that some day it would come down and strike me like lightning. But faith didn’t seem to come. One day I read in Romans that “faith comes by hearing and hearing by the word of God.” I had up to this time, closed my Bible and prayed for faith. Now I opened my Bible and began to study and faith has been growing ever since. 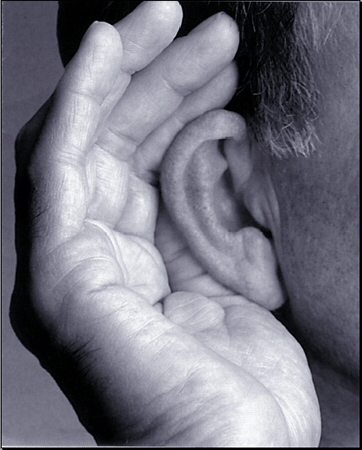 God whispers to us in our health and prosperity, but, being hard of hearing, we fail to hear God’s voice in both. It’s then that God turns up the amplifier by means of suffering. Then his voice booms. HERE is “Word of God, Speak” by MercyMe. What Shaphan had was the Torah, the first five books of the Bible, the books Moses had written. They recorded the origin of Israel and their early history. They told of God’s great power in delivering them from Egypt and bringing them in to the land of promise. But they also spoke of God’s law. They declared great blessings on obedience and terrible judgment on rebellion. As Josiah listened to Shaphan read the horrific curses on disobedience, his heart had to begin to lurch with fear. All he had to do was look around Jerusalem and Judah to see the evidences of nearly 75 years of the worst evil imaginable. There was idolatry everywhere; pagan altars filled the temple grounds and streets of the city, and the accursed high places his great grandfather Hezekiah had dismantled had been rebuilt by Manasseh. Everywhere he looked was evil. Huldah was a godly woman known to speak for God. The king’s delegation went to her with Josiah’s request, but her message was not very encouraging. The scales of justice had been tipped to judgment; it was too late to turn aside God’s wrath. 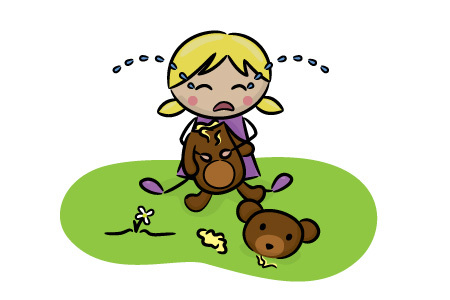 All that had been foretold in the Book of the Law would come to pass and Judah’s rebellion would be punished. The only word of comfort was that because Josiah had shown such remarkable repentance and sorrow before God for the sins of his fathers and people, the judgment would not come till after he was gone. For Josiah — mercy precedes judgment. Even though Huldah said that judgment would come, Josiah determined to do what was right in his own day. Chapter 23 will tell us of the marvelous and sweeping reforms he made to Jerusalem, the temple, the priesthood, and the entire nation. But what is striking about this passage is the revelation that the Book of the Law had been lost, of all places, in the house of the Lord! Their Bible, the books of Moses, the record of God’s covenant with His people, His commandments, His counsel, the record of His love, power, and truth, had been missing for generations. Yet the priests still went about their religious duties, the offerings and sacrifices were still made, the rituals were dutifully performed, the horns were blown, the lamps were lit—the show went on. But no one knew why or what for! One of the most important roles of the ministry of the priest was the task of teaching. Not only were they to officiate at the temple, they were also supposed to instruct the people out of the law. It was part of their solemn charge to not only represent the people to God, but to represent God to the people. And the primary way to do that was to read from and instruct them in the law. They were to tell the people of their godly heritage. They were to remind them of God’s love and power demonstrated in their history. They were to carefully show them the way of life through obedience to the covenant He made with them at Sinai. They had the wonderful privilege of bringing people into a relationship with God by showing them God’s revelation of Himself. But they had neglected this most vital part of their ministry. They neglected the teaching of the Word of God and turned to something else, something easier—temple service. And eventually, the Bible was lost in the house of God. 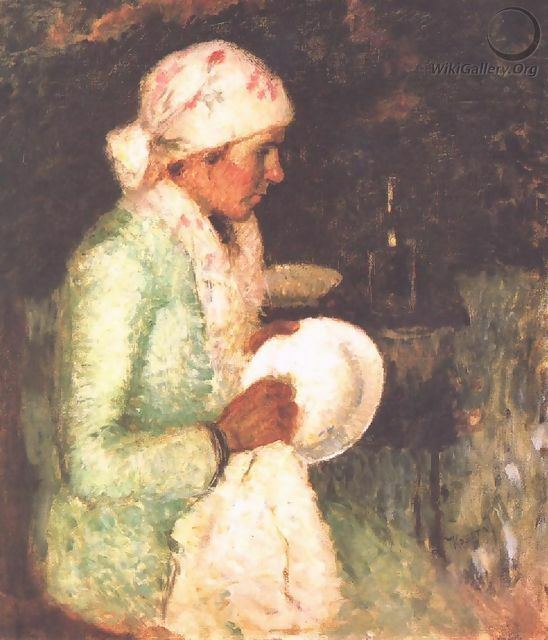 “Woman Drying a Plate” by Jozsef Koszta, 1919. Speaking through the prophets, the Lord describes the Southern Kingdom’s future using a metaphor of wiping dishes. 1 Manasseh was twelve years old when he became king, and he reigned in Jerusalem fifty-five years. His mother’s name was Hephzibah. Manasseh is, we shall see, a ruler given to all kinds of evil. 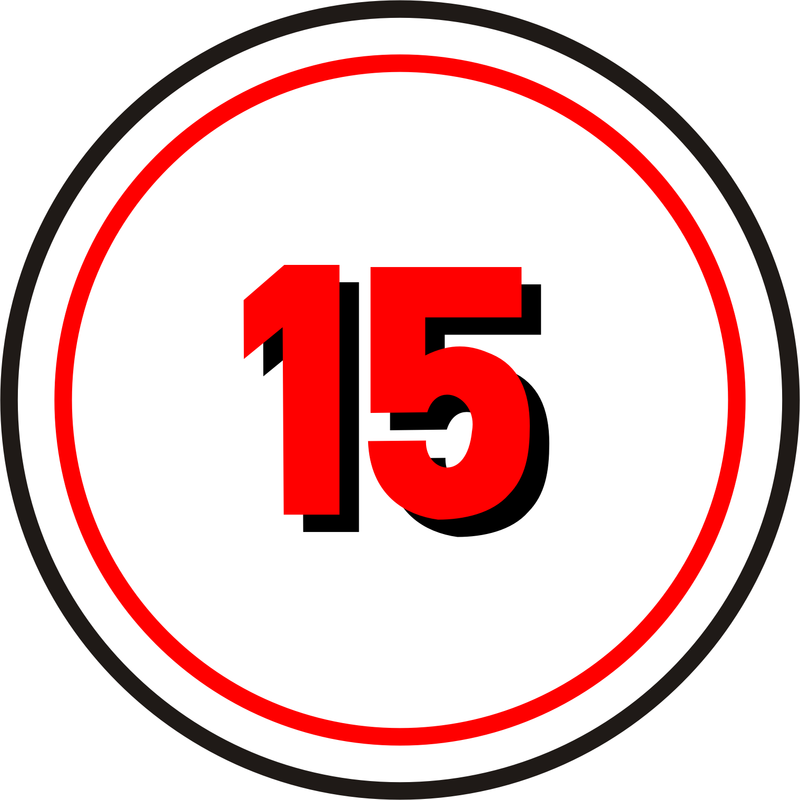 He was only 12 when his father died and he came to the throne, which means he was born in those last, gift-from-God 15 years of Hezekiah’s life. 2 He did evil in the eyes of the LORD, following the detestable practices of the nations the LORD had driven out before the Israelites. 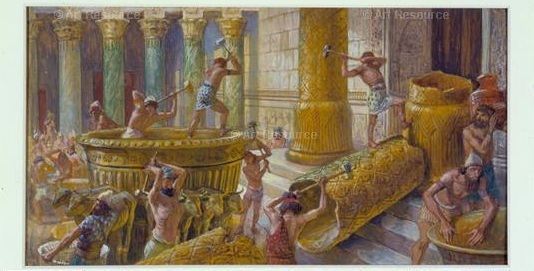 3 He rebuilt the high places his father Hezekiah had destroyed; he also erected altars to Baal and made an Asherah pole, as Ahab king of Israel had done. He brought Judah back to the old forms of idolatry . . . He bowed down to all the starry hosts and worshiped them. 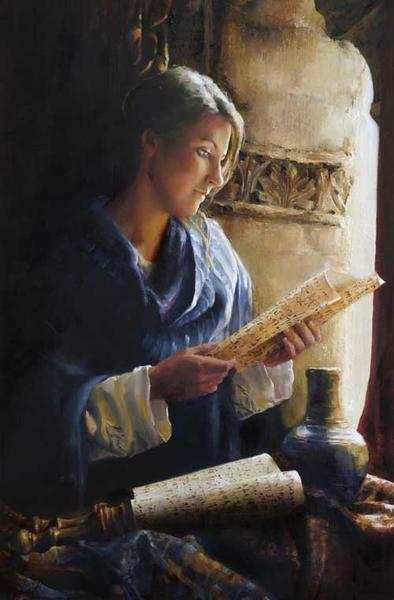 4 He built altars in the temple of the LORD, of which the LORD had said, “In Jerusalem I will put my Name.” 5 In the two courts of the temple of the LORD, he built altars to all the starry hosts.
. . . and he introduced his people to new ones. Moloch was made of brass; and they heated him from his lower parts; and his hands being stretched out, and made hot, they put the child between his hands, and it was burnt; when it vehemently cried out; but the priests beat a drum, that the father might not hear the voice of his son, and his heart might not be moved. 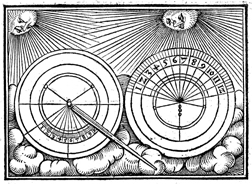 practiced divination, sought omens, and consulted mediums and spiritists. He did much evil in the eyes of the LORD, arousing his anger. Asherah was the Canaanite mother goddess of fertility. She was worshiped with temple prostitution — is Solomon’s temple now a common brothel? of which the LORD had said to David and to his son Solomon, “In this temple and in Jerusalem, which I have chosen out of all the tribes of Israel, I will put my Name forever. 8 I will not again make the feet of the Israelites wander from the land I gave their ancestors, if only they will be careful to do everything I commanded them and will keep the whole Law that my servant Moses gave them.” 9 But the people did not listen. 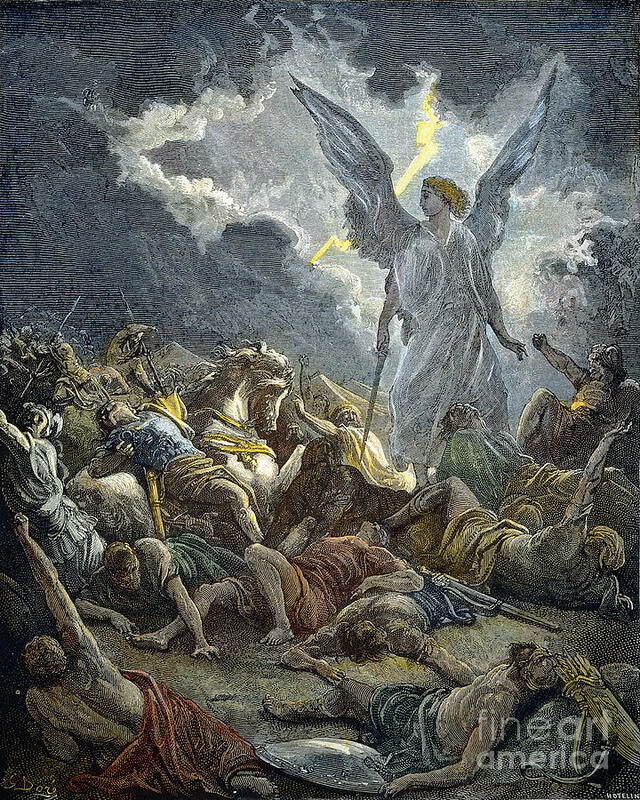 Manasseh led them astray, so that they did more evil than the nations the LORD had destroyed before the Israelites. 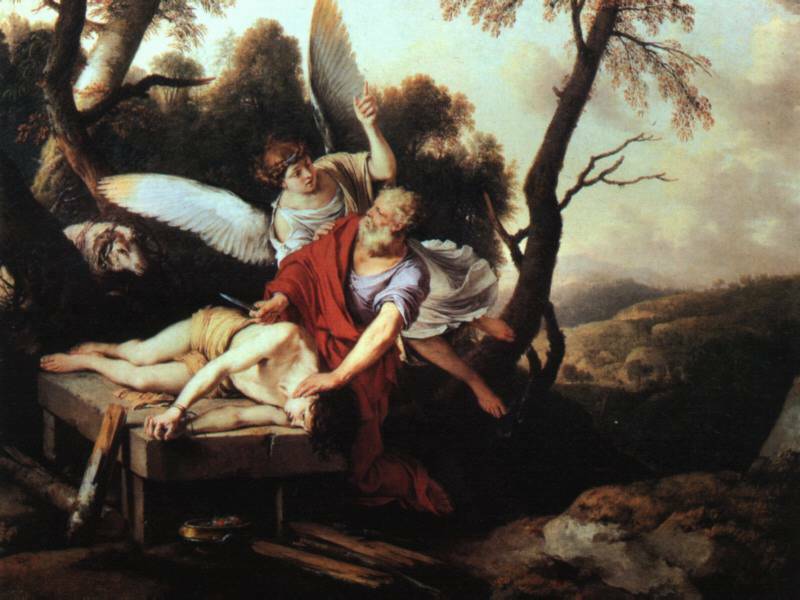 By tradition, one of the evils done by Manasseh was the murder of Isaiah the prophet. Many think that Hebrews 11:37 (they were sawn in two) is a reference to the martyrdom of Isaiah. 17 As for the other events of Manasseh’s reign, and all he did, including the sin he committed, are they not written in the book of the annals of the kings of Judah? 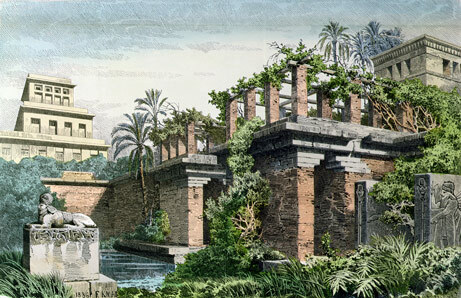 18 Manasseh rested with his ancestors and was buried in his palace garden, the garden of Uzza. 2 Chronicles 33:11-19 describes a remarkable repentance on the part of Manasseh. Because he and his people would not listen to the warnings of God, the Lord allowed the Babylonians to bind King Manasseh and take him as a captive to Babylon. There, when he was in affliction, he implored the Lord his God, and humbled himself greatly before the God of his fathers (2 Chronicles 33:12) and God answered his prayer and restored him to the throne. Manasseh then proved that his repentance was genuine by taking away the idols and the foreign gods from Jerusalem, and he commanded Judah to serve the Lord God of Israel (2 Chronicles 33:16). This is a wonderful example of the principle, Train up a child in the way he should go, and when he is old he will not depart from it (Proverbs 22:6). Manasseh was raised by a godly father, yet he lived in defiance of his father’s faith for most of his life. Nevertheless, at the end of his days he truly repented and served God. In this way, we can say that it was very true that Manasseh rested with his fathers. And Amon his son succeeded him as king. An evil father — the only good he did for Judah was to produce a son who would become one of the best kings ever. 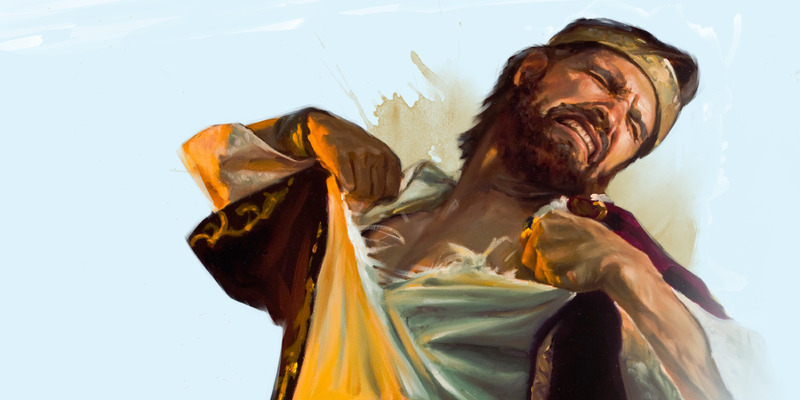 “In Times Like These” — how Judah needed the Lord, the Savior! But they probably wouldn’t have listened to that message, even with the Cadet Sisters bringing it so beautifully. So let us hear and bring joy to the Lord’s heart today by naming Jesus as our Savior! Click HERE.